National Volunteer Week 2015 is coming to a close. How has your organization celebrated? We know that “Your Volunteers Rock” and to help you celebrate National Volunteer Week (April 12-18), we provided ideas and resources for recognizing your volunteers' efforts. In addition, we offered up some inspirational ideas and 4 ways to celebrate and share your #NVW stories. As National Volunteer Week winds down, here is a link round-up of volunteer-related posts. Retention is Often Related to Self-Confidence – New volunteers must believe they have the capability to learn their new role and perform it to the organization’s satisfaction. If they doubt themselves, they will quit. Part of the onboarding process must provide them with the basic knowledge and skills to do the job confidently. Onboarding is Emotional – What volunteers imagine their volunteer experience will be like and what is actually like are often two different things. Because of this dissonance, newcomers negotiate a variety of conflicting emotions – surprise, fear, anticipation, joy, ambiguity, etc. – that result in changing perceptions and expectations…and even stress. Relationships Matter – To fully commit to a project, one must first commit to the people involved. This requires trust, and trust is developed through risk and relationship. During onboarding, volunteers need to have the chance to socialize with staff and fellow volunteers in order to disclose personal information and build common understanding, an important foundation of trust. Don’t Leave It Up To Chance! – Setting the stage for successful new volunteer onboarding and deeper volunteer engagement doesn’t happen by chance. It’s important to take the time to design a process that works. 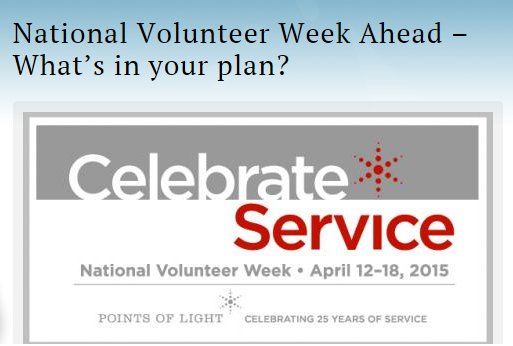 National Volunteer Week Ahead – What’s in your plan? #NWV snuck up on you again, huh? Well no fear – there’s still time to pull something out a hat for #NVW2015 and here are a few ideas! Check out Peggy’s post for details on how you can recognize your volunteers this year. At VolunteerMatch we learn so much from other experts in the field of volunteer engagement and management, and we want to help you stay up-to-date on the latest news and trends. There will be 23,000 volunteers at the 2015 Toronto Pan Am / Parapan Am Games, each putting in an average of 12 shifts. The Games spends a lot of time and money recruiting, selecting, training, outfitting and motivating the volunteers. A strong showing elevates the spirit of the games and keeps everything running. A poor showing can spell logistical disaster. Volunteer Engagement 2.0: Pre-Order Your Copy Now! In mid-May 2015, the book “Volunteer Engagement 2.0” will launch and I’m proud to be among 35 chapter contributors! Striking a balance between actionable strategy and broad discussion of the issues surrounding volunteerism, Volunteer Engagement 2.0 helps readers craft a volunteer program that reflects the organization’s mission and approaches daily management needs with an eye toward the future. Distilling the latest research and insight from industry leaders, Volunteer Engagement 2.0 is a must-read resource for anyone responsible for volunteer engagement, recruitment, and management. 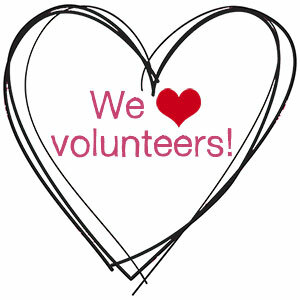 How did you celebrate National Volunteer Week? We’d love to hear your stories and recognition ideas in the comments below.